The curved back Metal-ArmorSM coated steel park benches are elegantly designed for a wide spectrum of design styles indoor or out. 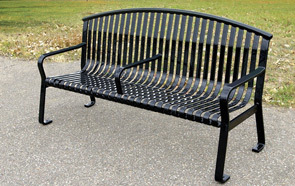 These Metal-ArmorSM Coated Steel Park Benches will easily withstand the harshest elements such as excessive sunshine and extreme weather conditions. The seats of these park benches are 1/4" x 1-1/2" rolled steel. The arms and legs are made of 5/8" x 2" rolled steel. 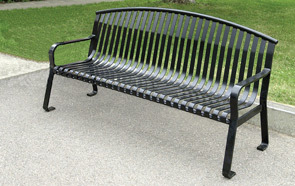 This coated steel park bench is available with an optional center arm. The center arm option helps to separate and expand your seating and prevents unwanted guests from sleeping on your park bench.